I can’t hear anything on my computer — why not? There are a few reasons why you might not be able to hear sound on your computer. Inside of an activity, click on the sound icon and select Sound on in the drop-down menu. For languages that use their own script such as Chinese or Japanese, tasks can be set up so that the sound is disabled in Reading Mode. This is to encourage students to not rely on audio prompts when in this learning mode. This can be seen in the settings of the task but there are no visual cues of this being the case from the student end. For a Windows computer, you can access your sound settings by clicking on the speaker icon located in the bottom, right-hand corner of your screen on your task bar. If there is a cross next to the speaker, this will mean that your computer is muted. 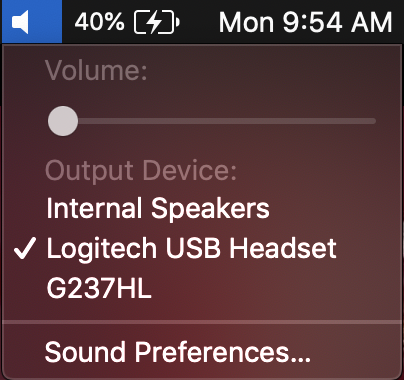 For Apple computers, you can access your sound settings by clicking on the speaker icon located in the top, right-hand corner of your menu bar. If the speaker icon looks the same as the one pictured below, your Mac is muted. In some cases, pages can be auto-muted in Google Chrome which can mute the audio in our lessons. If your students are having this issue, it is easily identifiable and simple to fix. A small speaker icon with a line crossed through it will appear in the tab containing the lesson for the duration that audio is playing for.This means that if audio has finished playing or is paused, the icon will not appear on the tab. To resolve this, right-click on the tab and select Unmute site from the drop-down menu that appears. If you are using headphones or external speakers, you may not be able to hear sound if they are broken, or not configured properly.